The fire has not moved any closer to Tassajara since yesterday. The fire continues to move slowly (about 1/10 of a mile yesterday), although the overall acreage has increased on the southern side. The Unified Fire Command Chief visited Tassajara yesterday, and reviewed our fire preparedness protocols. It’s likely we will get at least 2-3 days notice when the fire is getting closer. However, Unified Command Team are more confident now that they can contain the fire before it gets to Tassajara, which is more good news. The air quality at Tassajara remains good. 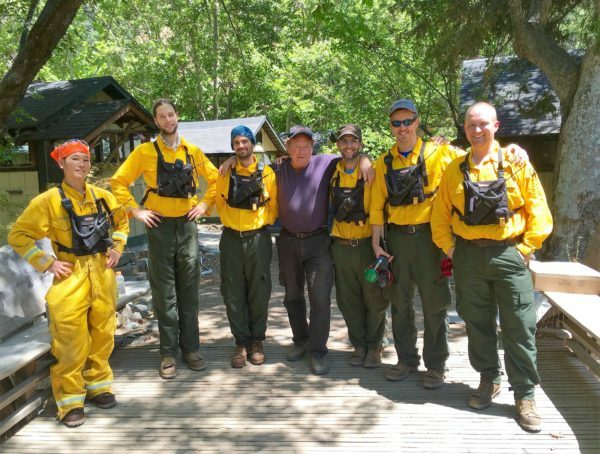 The fire crew: Diego Miglioli, Aaron Erb, Kogen Dito-Keith, and Joe Rawitzer. Two fire agency Public Information Offices visited, just to look around. They were given a tour, a warm work circle welcome, and when they departed they left a cash donation to Tassajara! 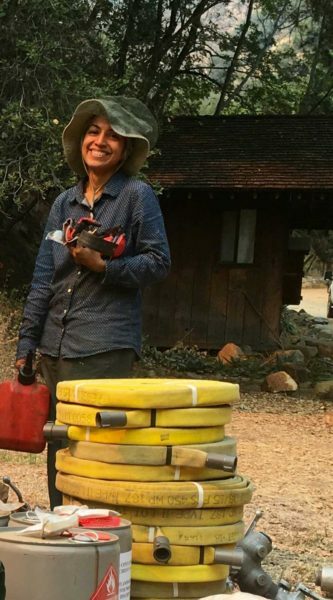 Yesterday’s fire “line crew” wasn’t able to return as they have been diverted to the Big Sur Coast where the fire is spreading. The fire is 45% contained, but on the northern and eastern and western flanks, not the southern. 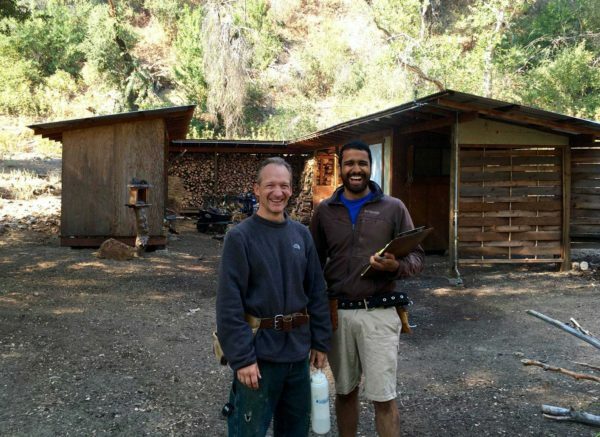 Kogen Dito-Keith especially wants to express his appreciation for the training he received in irrigation systems and in using the chain saw during his time at Green Gulch—training he received from Quayyum and Sarah—and which has been of great use in the present situation! “Samsara cinema” movie night in the Retreat Hall, with popcorn. Wes Anderson’s Moonlight Kingdom. A lovely break. For the past three days the fire has not progressed toward Tassajara, due to the cool weather and increased humidity that comes with the inflowing marine layer at night. Joe Rawitzer says that when the weather does heat up, the fire will start moving again. We had large “Tassajara Fire” signs printed at the FedEx office for the sides of some Tassajara vehicles for ease in moving through the roadblocks. We printed up laminated “Tassajara Fire” ID cards for the Tassajara Fire Brigade (all the trained fire people who will be staying until the fire comes), for ease in getting in and out. Fire prep goes on. 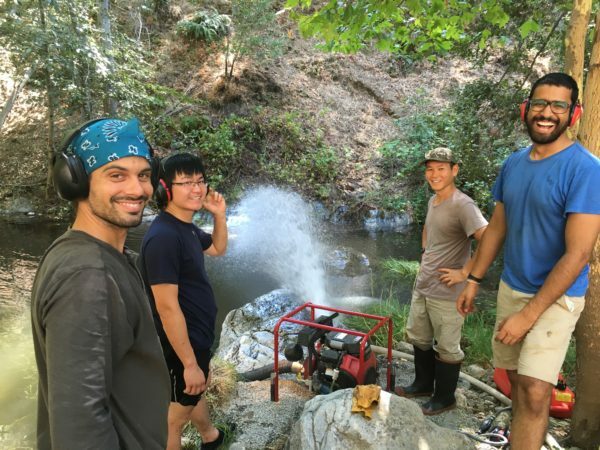 Dharma Rain and the creek pumps are being tested and adjusted every day. Today a test of Dharma Rain was conducted using only the swimming pool pump. That one pump was able to run 60% of the system. An early morning crew began at 6:00 am working to clear a fuel-free space around the helipad up on the overlook trail. Over the next few days students who live in the upper and lower barn and the “suburbs” cabins will be moving to the central area. We held another community meeting tonight. It was a chance for people to express their feelings about the continuing departures of students, and the eventual evacuation of everyone but the core of about 25 people who have had extensive fire training. The fire did not increase overnight, which is good news, and it is still the same distance from Tassajara. The air quality there is good. May it continue. Tassajara resident Jacqueline Goveas is ready. The fire has increased in size by around 1700 acres overnight, but is still about the same distance from Tassajara as yesterday. Jamesburg is now officially out of fire danger. Our focus now is making sure the crews are in place to help us when the fire does reach Tassajara. We are in regular touch with the various fire agencies to ensure we will have the additional support and equipment we need. Thank you for all your kind words of support. We very much appreciate it. Deep bows. The fire is still no closer to Tassajara at its closest point, which is about 10 miles away. It has remained pretty stationary here for the past few days. However, the southern portion of the fire is moving toward us, I think perhaps half a mile in the last day or two. This southern part of the fire may reach us first. There is nothing but wilderness between the fire and Tassajara. The fire is growing again. It’s now at 67,000+ acres, and 50% contained. However, the southeast sides of the fire are not contained at all. Please know that we who are here and living with this day by day are confident and prepared. We have deep faith in our practice, our training, our preparations and equipment, and each other. We’re ready. The fire is now at 60,400 acres and 45% contained. There are 5,028 firefighters trying to contain the fire. The fire is moving slowly, and is still 10.35 miles from Tassajara, and about 4 miles from Jamesburg. However, we know that the fire is likely to come close to Tassajara, and as a precaution, we are cancelling guest visits and retreats until August 22. 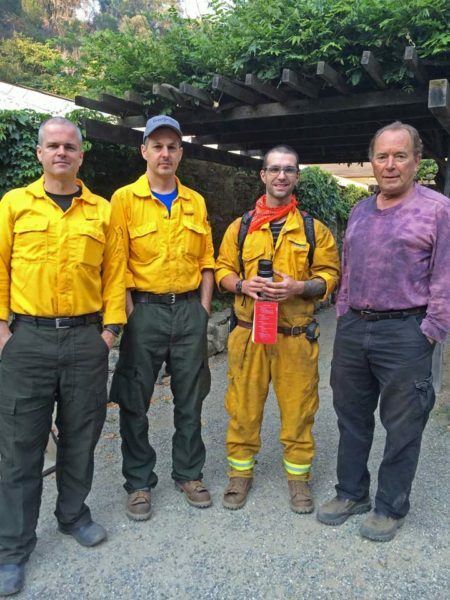 The Tassajara crews are working on building a fire line around the perimeter of Tassajara. Fire crews were there yesterday reviewing our preparedness, and said we have done a good job in preparing for the fire, plus we have an excellent crew at Tassajara who are trained in fire protection. The good news is that we have invested in much better fire protection systems to protect our buildings than the 2008 fire. May everyone be safe. With deep bows of gratitude to our firefighters. Thank you all so much for your kind wishes . The Cachagua Fire Department continues their back burning to build a fire line. The cooler humid weather is helping their efforts. The good news is that fire has not moved closer to Tassajara — it’s holding at 10.35 miles, and the fire is now 45% contained. Thank you for all your kind wishes, and deep gratitude for our firefighters. May everyone stay safe.